Michael Drayton (1563 – 23 December 1631) was an English poet who came to prominence in the Elizabethan era. Drayton was born at Hartshill, near Nuneaton, Warwickshire, England. Almost nothing is known about his early life, beyond the fact that in 1580 he was in the service of Thomas Goodere of Collingham, Nottinghamshire. Nineteenth- and twentieth-century scholars, on the basis of scattered allusions in his poems and dedications, suggested that Drayton might have studied at the University of Oxford, and been intimate with the Polesworth branch of the Goodere family. More recent work has cast doubt on those speculations. In 1590 he produced his first book, The Harmony of the Church, a volume of spiritual poems, dedicated to Lady Devereux. It is notable for a version of the Song of Solomon, executed with considerable richness of expression. However, with the exception of forty copies, seized by the Archbishop of Canterbury, the whole edition was destroyed by public order. Nevertheless, Drayton published a vast amount within the next few years. In 1593 appeared Idea: The Shepherd's Garland, a collection of nine pastorals, in which he celebrated his own love-sorrows under the poetic name of Rowland. The basic idea was expanded in a cycle of sixty-four sonnets, published in 1594, under the title of Idea's Mirror, by which we learn that the lady lived by the river Ankor in Warwickshire. It appears that he failed to win his "Idea," and lived and died a bachelor. It has been said Drayton's sonnets possess a direct, instant, and universal appeal, by reason of their simple straightforward ring and foreshadowed the smooth style of Fairfax, Waller, and Dryden. Drayton was the first to bring the term ode, for a lyrical poem, to popularity in England and was a master of the short, staccato Anacreontics measure. Also in 1593 there appeared the first of Drayton's historical poems, The Legend of Piers Gaveston, and the next year saw the publication of Matilda, an epic poem in rhyme royal. It was about this time, too, that he brought out Endimion and Phoebe, a volume which he never republished, but which contains some interesting autobiographical matter, and acknowledgments of literary help from Thomas Lodge, if not from Edmund Spenser and Samuel Daniel also. In his Fig for Momus, Lodge reciprocated these friendly courtesies. In 1596 Drayton published his long and important poem Mortimeriados, a very serious production in ottava rima. He later enlarged and modified this poem, and republished it in 1603 under the title of The Barons' Wars. In 1596 also appeared another historical poem, The Legend of Robert, Duke of Normandy, with which Piers Gaveston was reprinted. In 1597 appeared England's Heroical Epistles, a series of historical studies, in imitation of those of Ovid. These last poems, written in the heroic couplet, contain some of the finest passages in Drayton's writings. In 1627 he published another of his miscellaneous volumes, and this contains some of his most characteristic writing. It consists of the following pieces: The Battle of Agincourt, an historical poem in ottava rima (not to be confused with his ballad on the same subject), and The Miseries of Queen Margaret, written in the same verse and manner; Nimphidia, the Court of Faery, a most joyous and graceful little epic of fairyland; The Quest of Cinthia and The Shepherd's Sirena, two lyrical pastorals; and finally The Moon Calf, a sort of satire. Nimphidia is the most critically acclaimed, along with his famous ballad on the battle of Agincourt; it is quite unique of its kind and full of rare fantastic fancy. The last of Drayton's voluminous publications was The Muses' Elizium in 1630. He died in London, was buried in Poets' Corner in Westminster Abbey, and had a monument placed over him by the Countess of Dorset, with memorial lines attributed to Ben Jonson. Like other poets of his era, Drayton was active in writing for the theatre; but unlike Shakespeare, Ben Jonson, or Samuel Daniel, he invested little of his art in the genre. For a period of only five years, from 1597 to 1602, Drayton was a member of the stable of playwrights who supplied material for the theatrical syndicate of Philip Henslowe. Henslowe's Diary links Drayton's name with 23 plays from that period, and shows that Drayton almost always worked in collaboration with other Henslowe regulars, like Thomas Dekker, Anthony Munday, and Henry Chettle, among others. Of these 23 plays, only one has survived, that being Part 1 of Sir John Oldcastle, which Drayton composed in collaboration with Munday, Robert Wilson, and Richard Hathwaye. The text of Oldcastle shows no clear signs of Drayton's hand; traits of style consistent through the entire corpus of his poetry (the rich vocabulary of plant names, star names, and other unusual words; the frequent use of original contractional forms, sometimes with double apostrophes, like "th'adult'rers" or "pois'ned'st") are wholly absent from the text, suggesting that his contribution to the collaborative effort was not substantial. William Longsword, the one play that Henslowe's Diary suggests was a solo Drayton effort, was never completed. 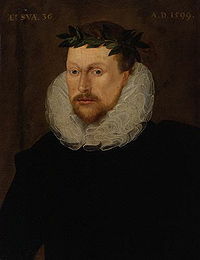 Drayton may have preferred the role of impresario to that of playwright; he was one of the lessees of the Whitefriars Theatre, together with Thomas Woodford, nephew of the playwright Thomas Lodge, when it was started in 1608. Around 1606, Drayton was also part of a syndicate that chartered a company of child actors, The Children of the King's Revels. These may or may not have been the Children of Paul's under a new name, since the latter group appears to have gone out of existence at about this time. The venture was not a success, dissolving in litigation in 1609. Drayton was a friend of some of the most famous men of the age. He corresponded familiarly with Drummond; Ben Jonson, William Browne, George Wither and others were among his friends. Vicar John Ward, who was translated to Stratford-on-Avon in 1661, in his attempt to compile hearsay of Shakespeare, wrote that "Shakespear Drayton and Ben Jhonson (sic) had a merry meeting and it seems drank too hard for Shakespear died of a feavour there contracted." This appears to have been written by Ward in preparation for his move to Stratford where he would have felt it politic to show familiarity with local lore. In one of Drayton's poems, an elegy or epistle to Mr Henry Reynolds, he has left some valuable criticisms on English poets from Chaucer's time to his own, including Shakespeare. That he was a restless and discontented, as well as a worthy, man may be gathered from his own admissions. In 1748 a folio edition of Drayton's complete works was published under the editorial supervision of William Oldys, and again in 1753 there appeared an issue in four volumes quarto. But these were very unintelligently and inaccurately prepared. A complete five-volume edition of Drayton's work was published by Oxford in 1931–41 (revised 1961), edited by J. William Hebel, K. Tillotson and B. H. Newdigate. That and a two-volume edition of Drayton's poems published at Harvard in 1953, edited by John Buxton, are the only 20th-century editions of his poems recorded by the Library of Congress. ^ Brink, Jean. 1990. Michael Drayton revisited. Boston: Twayne. ISBN 0-8057-6989-7. Pp. 1–10. ^ E. K. Chambers, The Elizabethan Stage, Oxford, Clarendon Press, 1923; pp. 306–8. F. E. Halliday, A Shakespeare Companion 1564–1964, Baltimore, Penguin, 1964. This article incorporates text from a publication now in the public domain: Gosse, Edmund (1911). "Drayton, Michael" . In Chisholm, Hugh. Encyclopædia Britannica. 8 (11th ed.). Cambridge University Press. pp. 557–558.